If you don't have a reasonable understanding of how a centrifuge works, or you haven't seen a typical centrifuge setup, see my YouTube Video or read the content of this page. This will help you make more sense of what follows. 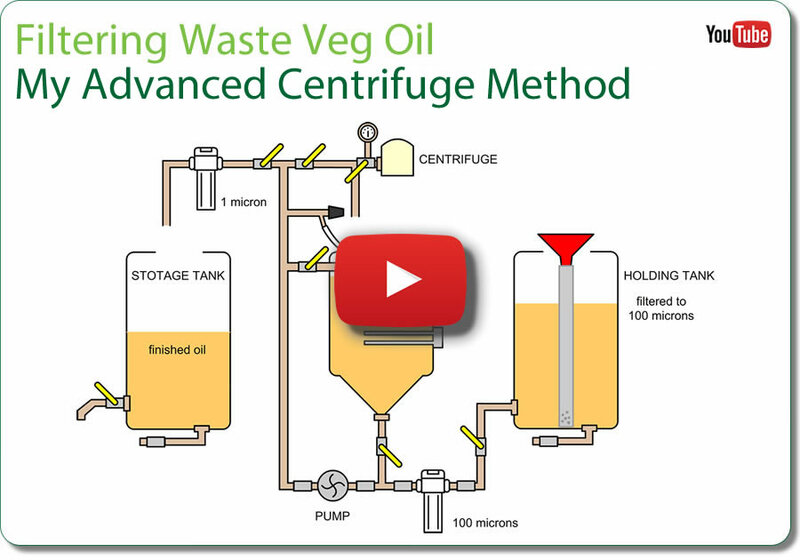 As I stated previously, one of the main drawbacks of using a centrifuge to filter waste vegetable oil is that you have to filter the oil before you even introduce it to the centrifuge. There are very fine holes in the base of the centrifuge that allow pressurized oil to jet out of them which, in turn, creates the spinning motion. These holes would clog immediately if heavy debris or animal fats were present. So, you have no choice, you MUST filter before you centrifuge. There's also the issue of fats. If you heat up your oil BEFORE you spin it in your centrifuge, then you're liquifying the fats so they cannot necessarily by filtered out by the centrifuge. This is a huge problem! I've been filtering for years, had a few spare bits knocking around, and decided I'd maximize the use of my pump and accessories. It struck me that if I had to filter before using my centrifuge, I may as well settle before using my centrifuge, so I designed a system that incorporated settling before and after the centrifuge. Consequently I configured my set up a little differently from the typical setup you may have seen (if in doubt, see my YouTube Video). I already had three tanks knocking around, so it made sense to me to use them. As you can see from the diagram above, by making use of a few shut-off / lever valves, I'm able to pump oil between all three barrels, which saves a lot of hassle. I also had two in-line filters left over from previous projects, so I placed one after the holding tank, filtering oil to 100 microns before the pump, and one before the storage barrel. This second in-line filter is just 1 micron and whilst it's not really necessary, I've got it so I may as well use it. It's a nice added extra. Beginning with the holding tank, I have a shelf placed just above the mouth of the barrel. On this I place the containers holding the WVO. I then poke a few holes in the container, just above the crud (the majority of fats, water and heavy debris - see the really easy settling method) that usually lies at the bottom. This then into and through a 100 micron sieve into the barrel where it sits and waits until the holding tank is full and I'm ready to do some filtering. In truth a full barrel can typically wait 3 to four weeks. During this time, of course, lots of wonderful settling is taking place. Water and fats are falling to the bottom of the barrel. 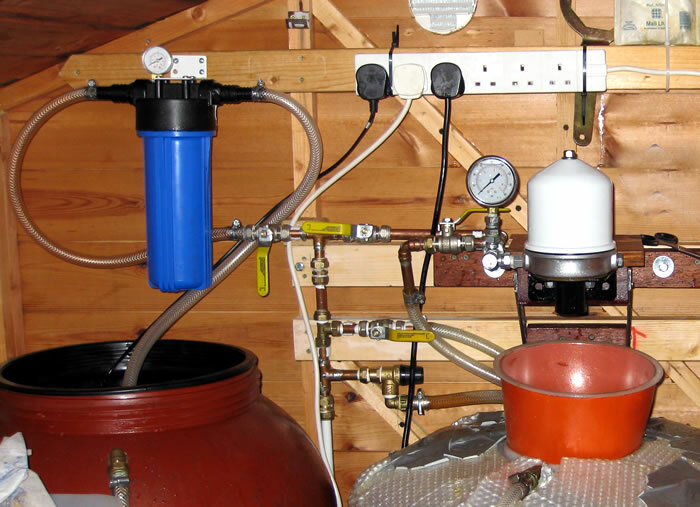 When I'm ready to begin, I flip open a couple of lever valves, turn on the pump and pass 80 litres or so of pre-filtered WVO into a conical tank (I had one already) which I've labelled here as the Filtering Tank. You'll also see that on its merry way, the oil passes through an in-line 100 micron filter. This isn't strictly necessary and it was already filtered before entering the Holding Tank, but I've got it so I may as well use it. Importantly you'll notice that the oil from the Holding Tank is not drawn from the bottom, where the fats and water lie, but from a few inches higher up, where the oil is hopefully fat and water from. Once the Filtering Tank is full, I flip the lever valves back in place (closing off the Holding Tank) then turn on the immersion heater. This is pre-fitted with a thermostat, but I tend to hang around just in case and manually check the oil temperature with a thermometer. When it's reached 50 degrees Celsius, I flip a couple more lever valves and oil begins to flow through the centrifuge. I take the centrifuge up to full pressure (7 Bar in my case) and then I walk away for a couple of hours. The important thing to remember with a Centrifuge is that the stuff that's being filtered out gets pushed up against the sides of the device through the centrifugal force. Once you turn off the pump, the centrifugal force lessens and the debris that was being held in place by the centrifuge will fall straight back into your oil. So you must - repeat MUST catch the crap. Personally I have a small plastic bowl. When I'm ready to finish, I quickly push the bowl beneath the centrifuge and then by-pass it with the appropriate lever valve, effectively turning off the flow. Thus the filtered debris then falls into the bowl and not into my nice clean veg oil. As soon as the centrifuge has dribbled out the last of it's content, I get straight on with cleaning the centrifuge. Don't put this off. Do it now! It's an expensive bit of kit so don't let it clog up with hardened oil. This again is an important stage. Once the centrifuge has done it's job, the oil may well be clean but also hot! Hot oil has to cool, possibly creating condensation and thereby introducing water into the mix again - at least that's my theory. So I walk away for 24 hours - that's right, a whole day. During that time the oil cools and (possibly) condensates. But lets ignore that fact for now. So why wait 24 hours you ask? Because I'm going to pump the oil through another filter and hot oil passes through filters too easily - in other words hot oil doesn't filter. Plus, if any fats were present in the oil, at higher temperatures these would liquify and again pass straight through the mechanical filter. So wait a day, let it cool, and be sure that the filter gets a chance to do its job. Once the oil has cooled nicely, I again make use of the pump. I bless the pump each time I use it and remember the days when I had to transfer the content from one barrel to the other by hand. Pumps - bloody brilliant! Anyway, if you look carefully at the set up diagram, you'll see that the design allows the pump to function all the time without stopping the flow (which would damage the pump), but it does mean you have to be vigilant with the lever valves. You'll notice that I have a 1 micron in-line filter off to the left. This is isolated by another lever valve. Whilst the pump pushes oil in and out of the barrel in a continuous cycle, it's possible to slightly open the level valve next to the filter and allow all to pass through at VERY LOW pressure. You'll see from the photo above that the filter has a pressure gauge on it. If you FORCE oil through, it will pass through, regardless of the filter element. In other words, forced oil does NOT filter. So you need to pass the oil through very gently and allow the filter to do its job. I find it take a couple of hours to pass 80 litres or so through the filter element into the storage tank, but you can't rush a good job! WARNING. Don't kill your pump. Don't empty all the all from your Filtering barrel. Leave 10 or 20 litres behind to give the pump something to work with. You NEVER want you pump to run dry so always make sure it sits low in your system and that it constantly has oil within it. Me being me, I leave the oil in the storage tank for at least a couple of weeks. Sure it's been pre-filtered, spun in a centrifuge and passed through a 1 micron filter, but I still fear the introduction of condensation during the cooling stage. 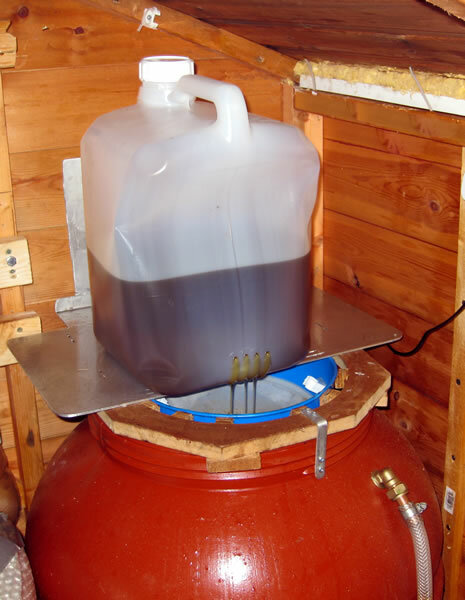 By allowing my oil to settle one last time, I can be sure of a perfectly filtered batch!